Newby’s Ice Store stood on the north bank of the canal in the 1860s, between what’s now the football pitch and the canal walk. Ice was used to keep food fresh during transport and in shops. Imported mainly from Norway, it was delivered along the canal by horse-drawn barges to Newby’s store, where it was stored in ice wells deep below the level of the canal. 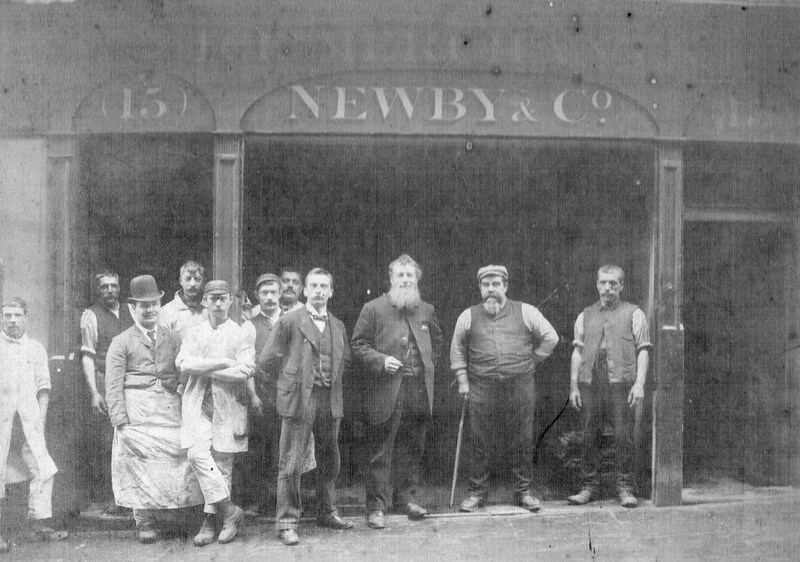 Like many interesting industries carried out in the area, Newby & Co. Ice Store was an enterprising Victorian business filling a role which has since been overtaken by newer technology. It was owned and run by the Newby family, who were also Billingsgate fish merchants. 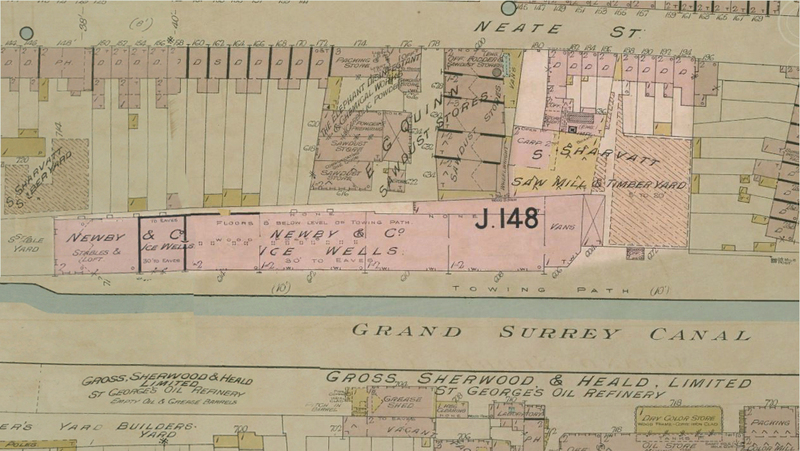 A prosperous firm, they had an office and family residence at 14/15 St Mary-at-Hill in the City, business space at Billingsgate Fish Market, where they must have done a good deal of trade, and the ice works and storage by the canal in Camberwell (possibly including the land occupied by the neighbouring timber merchants). They also owned the terrace of houses in Neate St, 180-194, just by the ice works, which probably flanked the road entrance to the works (see plan above). Ebenezer, who was granted the Freedom of the City of London in 1878, died in 1910, leaving £100,000. The business began in the 1840s and closed some time in the 1920s. Scandinavian ice was transferred from ships in Surrey Docks and delivered to the store along the canal by horse-drawn barges. No known pictures survive of the Newby & Co. ice store and little is known about the processes carried out there. However, people remember its canary-coloured gates and that the ice was taken away for delivery on horse-drawn trucks of the same colour. The ground floor of the building was 8 feet below the canal towpath, and the wells for storing the ice may have been deeper still. 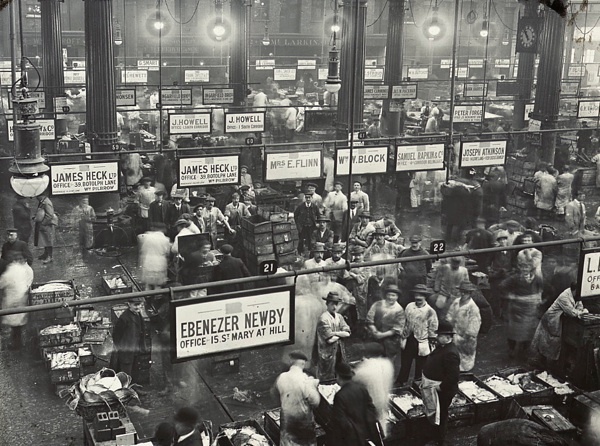 Newby and Co. probably served the first indoor purpose-built market (1850) at Billingsgate in the city, and its 1876 successor, which still stands today, until the market installed its own ice-making plant in the 1920s. What was the ice used for and where did it come from? In the 19th century there were no refrigerators, so shops like butchers and fishmongers used ice to keep goods from going off. Ice was also used in general food preservation, for making ice cream and for medical treatment. London wanted ice in far greater quantities than the British climate could provide. 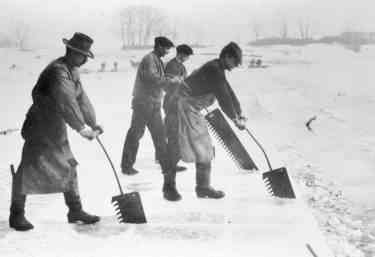 Whilst ice was gathered from lakes and canals in the UK, the amount available was small and the quality was often poor. Ice started to be imported from abroad, particularly Norway. A number of ice wells, such as the one that stood on the banks of the Grand Surrey Canal, were dug to receive and store it until it was wanted by customers. In the last 40 years of the 19th century, Norwegian ice dominated the London market. 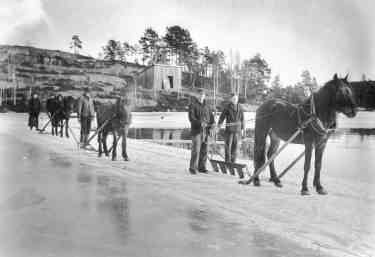 Horse-drawn ploughs were used on the mountain lakes of southern Norway to collect the ice. These lakes were relatively accessible and provided plentiful supplies of good quality clean ice. 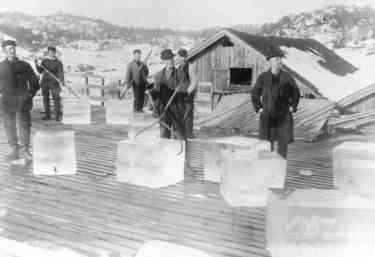 Individual blocks of ice had to be cut by hand, using metal saws. Once it had been cut, the ice was handled with ‘ice dogs’ – metal tongs hinged in the middle. Similar tongs were used for lifting blocks with a crane. From the lake, the ice was slid along giant wooden ice slides to the sea. 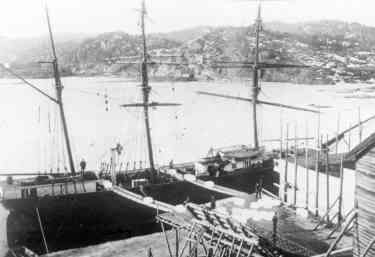 Once the blocks reached the port, they were stored until being loaded on board ships at a number of points along the southern Norwegian coast. In the 1890s, Norway was exporting 340,000 tons of ice each year. From Norway the ice was carried by ship to Regent’s Canal Dock, now called the Limehouse basin, in east London or to the Surrey Commercial Docks. From there it was transported inland. The London Canal Museum on Regents Canal near King’s Cross was also an ice store, and you can see what their ice wells look like LIVE! 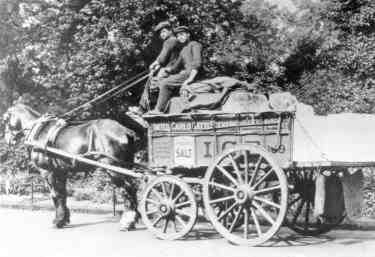 Ice was delivered to homes and businesses by horse-drawn carts. The ‘ice-man’ would chip off a block the size you wanted. Ice was stored in shops in large walk-in cupboards. The natural ice trade began to decline at the end of 19th and the start of the 20th century, when it began to be produced in factories. For more information about the ice trade visit the London Canal Museum near King’s Cross, which provides a fascinating history of London’s canals, about the cargoes carried and the people and animals who worked on the waterways. With especial thanks to great-great grand daughter of Ebenezer Newby, Lois Dyte, of the Morrant family for much of the detail on the Newby family. Many thanks to Alun Thomas for his help with this article. Images/graphics reproduced are believed to be out of copyright or are from the collection of the London Canal Museum.